Senator Chuck Grassley on the Boston Marathon bombing trial fallout: Agencies are gearing up to do battle and are preparing their defenses - THE BOSTON MARATHON BOMBINGS:What Happened? As jury selection for the trial of suspected Boston Marathon bomber Dzhokhar Tsarnaev entered its second day Tuesday, Senator Chuck Grassley accused Intelligence and Law Enforcement agencies of an orchestrated cover-up over 'what they knew and when', and says the same agencies are now engaged in a battle to shift blame, desperate to avoid any awkward questions the Tsarnaev trial may bring.
" I am deeply troubled by the incidents at the Boston Marathon and I grieve for the friends and family members that were lost", Grassley told us, "[But] In the weeks after the bombings, law enforcement and intelligence agencies have told conflicting stories - Bureaucracies are gearing up to do battle over who dropped the ball". Grassley, a senior Republican from Iowa and a member of the Senate Judiciary Committee, first asked tough questions about the FBI's relationship with Tamerlan Tsarnaev back in June 2013, then wrote a scathing letter to former FBI director James Comey in October 2013, complaining he was repeatedly stonewalled on the issue. 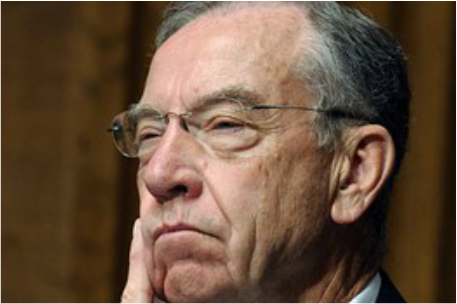 "Congress and the public have a growing number of questions...But the Senate Judiciary has not yet received clear answers to our questions", said Grassley. Tamerlan, 26, died in a hail of bullets during a shoot-out with police in Watertown in the early hours of April 19 2013, four days after the April 2013 explosions. Dzhokhar, 21, fled the scene, but surrendered himself to police after he was found sheltering in a dry docked boat, severely wounded, 18 hours later. The FBI say they found nothing suspicious about Tamerlan after investigating him for alleged "extremist behaviour" in 2011, and deny they ever tried to recruit him as an informant. The Bureau insists it did not know the identities of the of the suspected marathon bombers until they fingerprinted Tamerlan's corpse. "They are preparing their defenses. They're leaking bits and pieces of information favorable to themselves. Our government was reportedly warned on multiple occasions that one of the brothers had become a radical jihadist", said Grassley, "...At the end of the day this is about much more than who dropped the ball, it's about learning from mistakes and doing a better job next time. We need real transparency about what happened - not just talking points from agencies trying to deflect the blame." Dzhokhar Tsarnaev has pleaded not guilty to 30 charges connected to the April 2013 bombings that killed 3 and injured more than 260. He has been held in solitary confinement since his arrest and faces death by lethal injection if convicted. Jury selection is expected to take at least three weeks with testimony set to begin around January 26. Official confirmation the FBI lied?